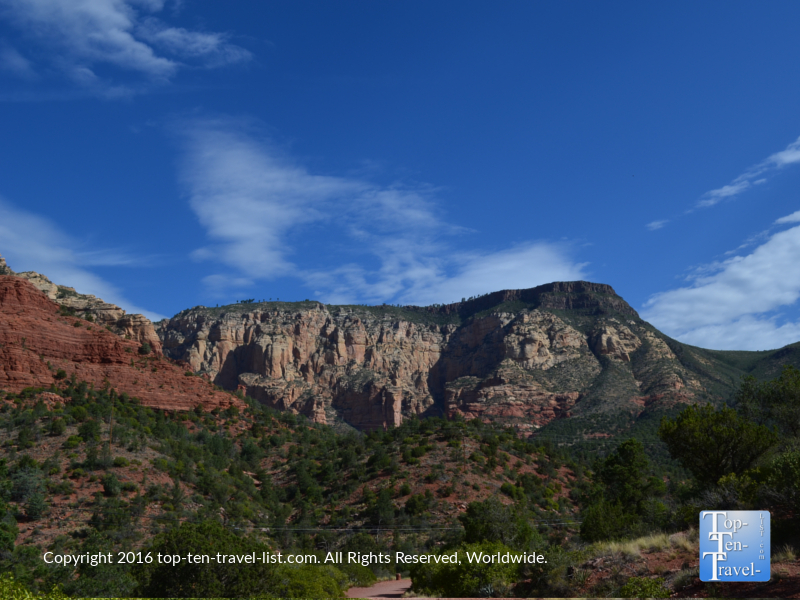 5 Beautiful Sedona Summer Hikes - Top Ten Travel Blog | Our experiences traveling throughout the US. 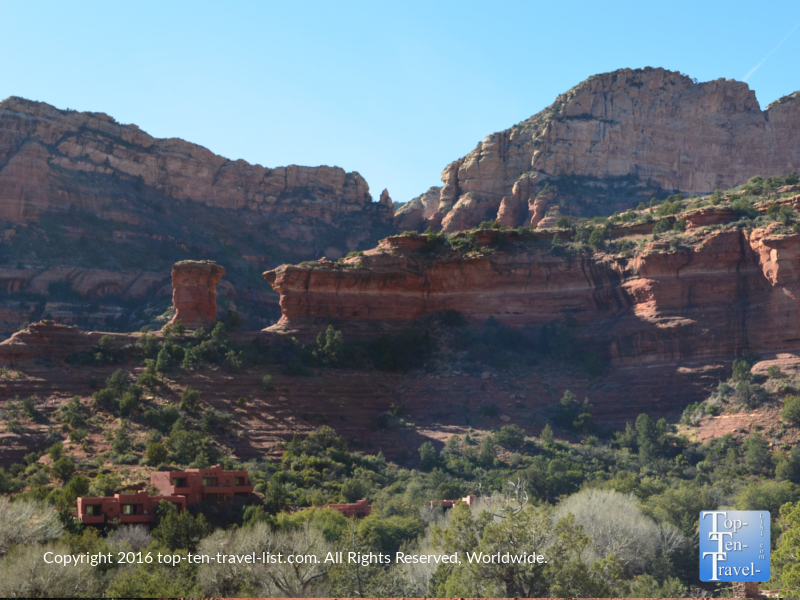 While the 90-100 degree summer days of Sedona may feel like a welcome respite to the many Southern Arizona daytrippers who frequently flee up north to enjoy the cooler weather, for most tourists, hiking during Sedona’s hot summer season is not ideal. Add in blazing sun and little to no shade, and many of Sedona’s stunning hikes are definitely off limits. The fall and spring seasons are by far the best time weather-wise to enjoy the enchanting red rock formations in a comfortable setting. 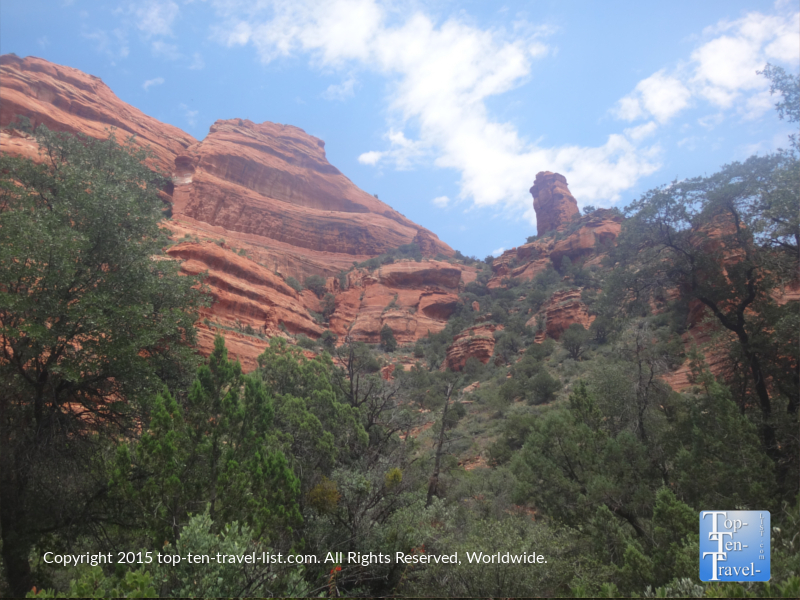 If you do intend on visiting Sedona in the summer, there are numerous shorter, flatter, & shadier hikes which offer many of the same gorgeous red rock views as the longer more intense trails. Planning accordingly and setting out early in the day will ensure that you can take in the wonders of this incredible area without risking dehydration and heat exhaustion. 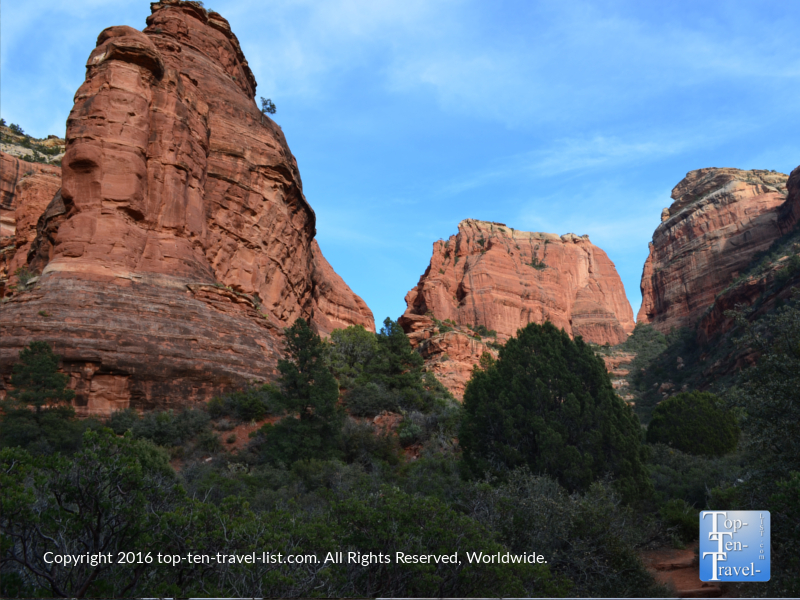 The easier hikes listed below will allow you to take in the tremendous red rock scenery, which has earned Sedona the nickname “Red Rock Country,” without being out in the heat/harsh sun for too long. While not necessarily the most jaw dropping options in town, the hikes listed below are all picturesque, relatively easy without major elevation gain, and somewhat shady. Sedona mornings are typically in the pleasant 60-70 degree range, but rise rapidly after mid morning, so it’s best to hit the trails as early as possible! Fay Canyon is my top hiking choice during the summer season. Not only is this hike super short and shady with barely any elevation gain, it’s also jam packed with gorgeous red rock views. You do not have to sacrifice the big views here. Despite the short trek, you will get to enjoy numerous unique rock formations, watch for wildlife (black bears have occasionally been sighted! ), and explore the diverse plant life found throughout the Red Rock Secret Wilderness. This hike is located about 20 minutes outside of town, however, the drive over to the trailhead is gorgeous. If you are up for a bit of challenge and want to see a truly impressive sight, you can take a short side trail to a natural arch formation. This detour is located about 1/2 mile into the trail and is definitely worth the extra trek for the unique lookout. The Templeton Trail is another short, mostly flat trail which offers stunning vistas of Cathedral Rock, one of Sedona’s most powerful vortexes. Vortexes are areas of enhanced natural energy where thousands of people have reported feeling motivated or energized. At the Cathedral Rock trail, you will simply follow the route of the Templeton as opposed to following the tourists who will begin the intense climb up the Cathedral Rock formation. While this hike is stunning, it’s quite challenging, completely devoid of shade, and thus, better suited for the cooler months. On the contrary, the Templeton, is a quiet enjoyable trail which can be enjoyed anytime. At just 2 miles round-trip, the Templeton is the perfect option for a quick stroll before the harsh heat of the afternoon sun hits. It’s also quite shady for more than half the route. This is one of the few trails where you will get to stroll along a portion of the beautiful creek. 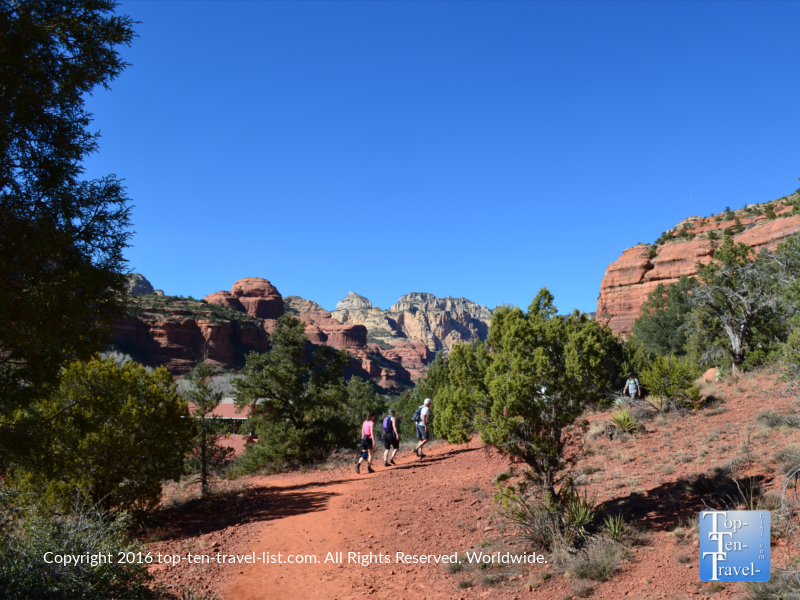 It is a very underused trail, and thus, one of the more peaceful hiking experiences you will have in Sedona. 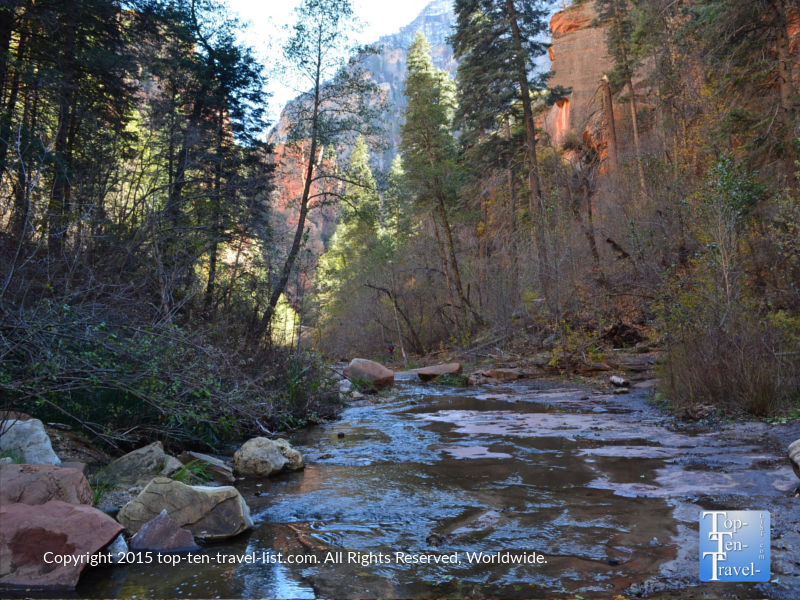 The West Fork is a gorgeous creekside hike located near the half way point of the incredible Oak Creek Canyon scenic drive. This scenic drive, consists of dramatic scenery & elevation changes, with everything from red rocks to ponderosa pines providing the backdrop. The West Fork is the most popular trail within the massive Coconino National Forest, which stretches on for over a million acres between Flagstaff and Sedona. This trail sees its’ majority of visitors during the summer (when Southern Arizonians flock up to enjoy the cooler temps) and again in the fall when the path is lined with bright fall foliage. Besides beautiful leafy views you will not find anywhere else in Arizona, you will also enjoy magnificent red rock views, in addition to 13 fun and slightly challenging creek crossings. 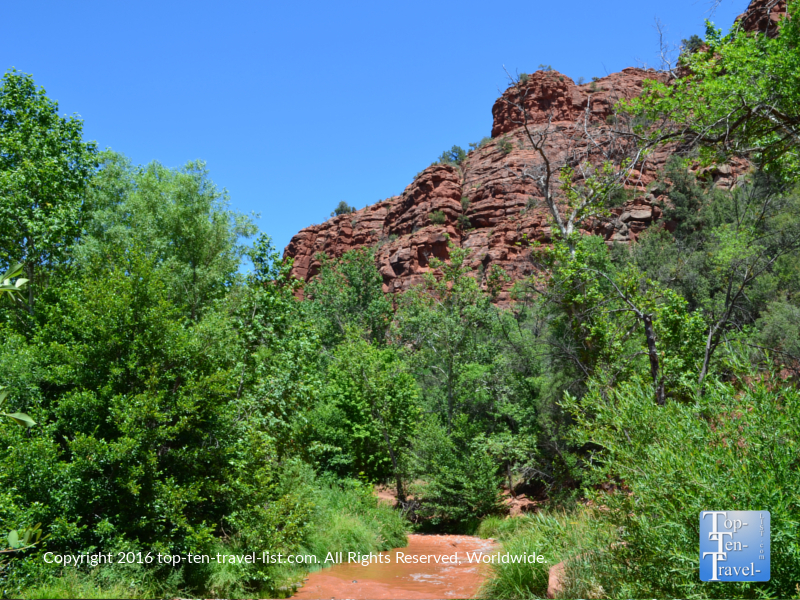 Due to the ample shade coverage, West Fork is by far the best summer option in the Sedona area. This trail is quite long at nearly 7 miles RT, however, it is very flat and the scenic natural surroundings make the time fly by. Regardless, if you would rather keep it short, you can simply go out to your preferred distance. Before your hike, you will definitely want to enjoy a breakfast and expertly made coffee at nearby Indian Gardens, which is home to the nicest garden patio. Wilson Canyon is a scenic 1.5 mile out-and-back trail which starts at the very popular Midgley Bridge overlook on Oak Creek Canyon drive. This is one trail you will want to arrive at extra early as parking is limited and fills up fast, as Midgley Bridge is one of Oak Creek’s most popular viewpoints. The short trek through Wilson Canyon is shady and cool so you won’t have the sun beating down on you constantly. Isolated wilderness awaits you as soon as you leave the Midgley bridge area. Plant life is diverse here and consists of live shrub oak, Arizona cypress, & various cacti species, and wildlife is also plentiful. While Wilson lacks some of the big red rock views of the other trails in town (although the beginning does feature some outstanding vistas), it’s one which offers serene views of the red rock secret wilderness and ample shade coverage so you can take your time hiking this one, enjoying the lush natural surroundings. Boynton Canyon is one of Sedona’s most interesting hikes. Featuring diverse scenery changes, powerful vortex energy (Boynton is one of 4 vortex hikes), and wide open views of towering red rock formations, it’s a must-do while in town. Fortunately, this trail is mostly shady, and therefore, a great summer choice. Although Boynton is nearly 3 miles each way, this trail is mostly flat with minimal elevation gain. Despite the immense beauty, it remains pretty quiet and you should not see more than a handful of hikers around. This trail is really unique in that you start off surrounded by big towering red rock formations and end up walking through a shady canyon and forest. One time in the spring we began the trail in the harsh sun and ended up putting on gloves and we trekked through some lingering snow in the forest! As diversity of landscapes and weather go, Boynton is as exciting as it gets in Sedona. *Hiking in the morning is definitely preferable to sunset hiking. Temps are much cooler in the mornings as nightime temps tend to take a while to cool off. *Wear a camelback to esnure you have a proper supply of water. A few electrolyte containing snacks is also a good idea. Fill up at the wonderful free spring water tap along Oak Creek canyon drive near mile marker 387. You will see a bunch of cars parked along the side of the road filling up. *Avoid weekends, if possible. Sedona is really busy most summer weekends and holidays. Visiting during the week will ensure a more peaceful trip, ease of finding parking, a shorter wait at restaurants, etc. *The best breakfast & coffee in town can be found at Indian Gardens. Other decent choices are Che-Ah-Chi at the Enchantment Resort, The Heartline Cafe, and Red Rock Cafe. *In terms of hotels, The Inn Above Oak Creek is a wonderful budget friendly choice with rooms overlooking the creek, a decent continental breakfast, 24/7 coffee, and a convenient central location.